In its almost anything, the Augvape BTFC dripper brings some nice surprises in its airflows and plateau. It produces an excellent and versatile vape. In a word, it’s a success. 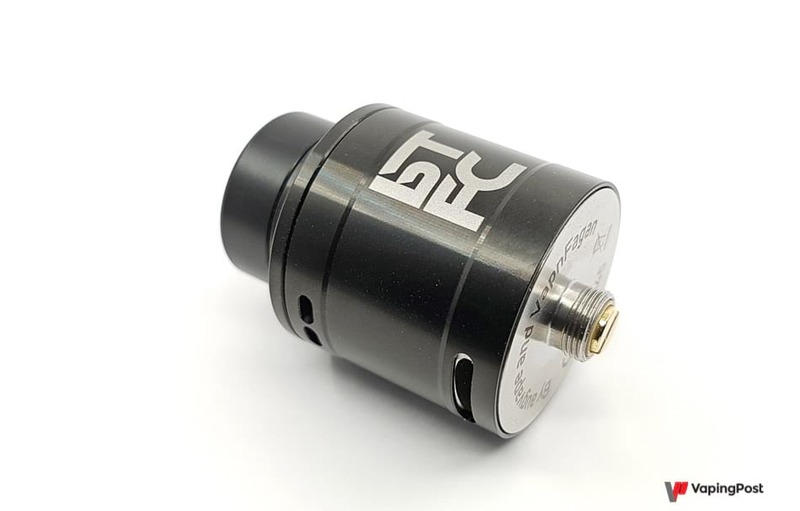 The BTFC was born from a collaboration between Augvape and the YouTube reviewer VapnFagan . The main idea was to create a dripper able to adapt to its own preference of vape depending on whether you are looking for steam or flavors, hence the idea of ​​offering air flows up and down, BTFC wanting say ” Bottom Top Flavor Clouds “. Cylindrical reinforced cardboard, the box is quite nice. The BTFC has a diameter of 25 mm for a height of 26.5 mm, and if the inscription of his surname on the bell is not especially discreet, it is however the only inscription of visible and its only true aesthetic defect. The 810 extra large drip tipcan be replaced by a second one, also in 810 format, which is translucent and more reasonable in width. If you do not like it either, you are free to put another one on condition that it is seamless and that it respects the format. A 510 BF pin is also attached, which is always appreciated. 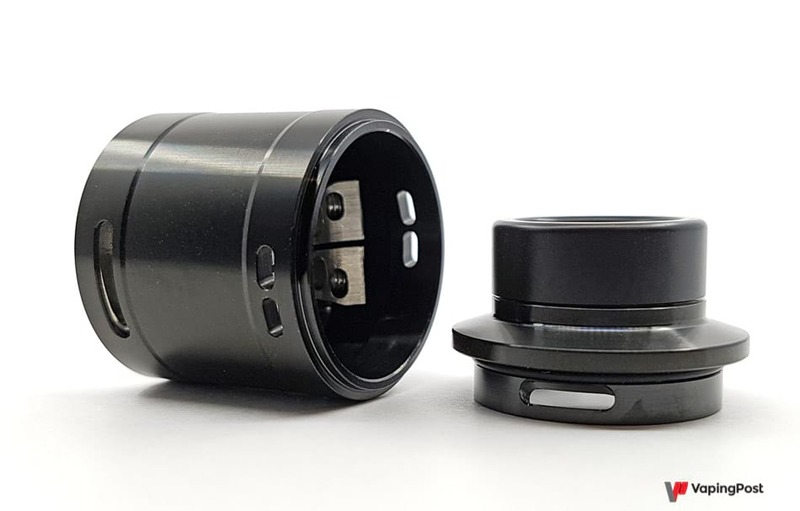 However, unlike the majority of drippers that are coming out right now, the BTFC has a really deep 11mm tank that allows it to be used in dripping without having to fill it every two puffs. It is thus a dripper really exploitable as well in bottom feeder as in dripping that proposes to us Augvape. All parts are properly machined with properly calibrated seals. The paint is slightly glossy without being a mirror effect, it does not retain fingerprints and is scratch resistant. Augvape remains faithful to the care given to his productions. The BTFC plateau is one of the most successful I’ve had in my hands lately. Apart from the fact that it allows ventilation of the coils from below and laterally, the assembly of the coils is really very simple. The passages for threading the legs of the coils are oriented obliquely downwards. In this way, it is not necessary to cut beforehand, even if they are several inches long, nothing prevents their placement. Once the coil is in place well above the bottom air inlet, simply tighten and cut the excess. The inclination of the studs and the fact that they are placed at the edge of the plate allow complete accessibility to the screws and legs. For the placement height, you just have to make sure that by putting the barrel back without the top cap you can see the coils through the air inlets. Once the assembly is raised, the flow will be slightly directed towards the bottom of the coil thanks to a beveled part located on the top cap. The BTFC can also be used in single coil, but to be honest, the result is not really convincing. Not that mounting is a problem, but the vape it produces in this configuration is not up to par. The fault lies with the bottom air inlets that are eccentric to better cool the double coil assembly. 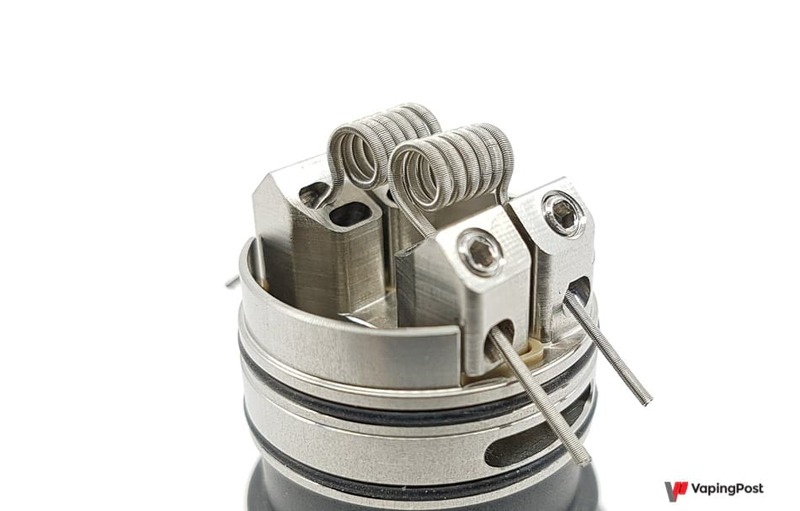 In single coil, it must at least go up to 3.5 or even 4 mm in diameter if we want the upward flow comes to rub elbows the coil, and still, it is not really convincing. The BTFC is definitely a dripper thought for the double coil. The vape quality of the BTFC is therefore due to the placement of the coils and of course, to its airflows. The air inlets are four in number, and one could almost say that in fact, there are six. At the top, 2 small openings separated on each side allow to act mainly on the production of steam. Just turn the top cap to change the aperture. Downstairs, two large openings in Cyclops act rather on the restoration of flavors. In reality, it is not as simple and if one opens that the top or bottom arrivals, the vape is not very qualitative. For the production of steam, the setting is not complicated: we open all the airflows by raising the power and it’s gone. With coils that give a total of 0.18 ohm, 70 W is a bit of the maximum limit for staying in a vape that is hot, but looks like something, as long as you do not string more than three flushes in a row. If you want a good compromise between flavors and steam, you have to play on both airflows and power. 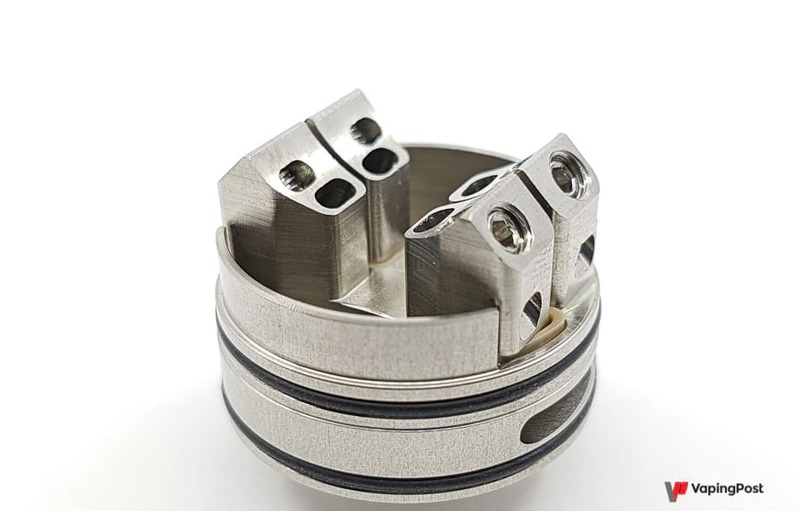 Always with the same coils of 0,18 ohm, the compromise is for me an opening of a hole at the top and of 3/4 at the bottom for a power of 40-45 W. The flavors are then quite well detailed and the steam generous. Note that it is not necessarily obvious to see the top opening. On our black version, the top cap is also of this color and you have to play a little with the light to see the closing. Finding your vape with the BTFC is not done in 30 seconds. It takes a little time to tame the beast and many parameters are taken into account: the liquid, the type of coil, the mounting placement, the drip tip used, the cotton, the power of use, etc. But once found, the vape is nice and tasty. The BTFC RDA of Augvape is really a very good dripper. Its versatility is exemplary, both in its use that can be conventional or bottom feeder, as the vape it provides, tasty or steam oriented. His tray is a joy to install his coils, and its design reveals many thoughtful details. I recommend it without problem. Freemax Mesh Pro Sub Ohm Tank Review – Perfection From Freemax – Again!